KEEP OUT OF REACH OF CHILDREN. NO LIGHTER IS CHILD-PROOF. 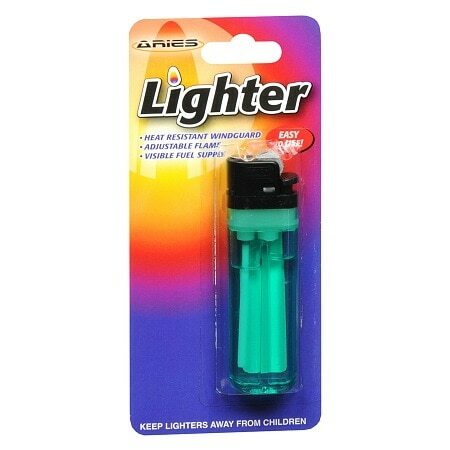 THE CHILD RESISTANT FEATURE OF THIS LIGHTER IS NOT A SUBSTITUTE FOR PROPER ADULT SUPERVISION. IT MAY BE POSSIBLE FOR SMALL CHILDREN TO OPERATE THIS PRODUCT IF LEFT UNATTENDED, WHICH COULD LEAD TO SERIOUS PROPERTY DAMAGE, INJURY, OR DEATH. CONTAINS EXTREMELY FLAMMABLE GAS UNDER PRESSURE. KEEP AWAY FROM HEAT AND FLAME. KEEP AWAY FROM FACE AND CLOTHING WHEN IGNITING. BE SURE FLAME IS COMPLETELY OUT AFTER EACH USE. KEEP AWAY FROM HEAT ABOVE 120°F (49°C). DO NOT INCINERATE, AND AVOID PROLONGED EXPOSURE TO SUNLIGHT. DO NOT KEEP CONTINUOUSLY LIT FOR MORE THAN 30 SECONDS..